Here you are, the tiniest little sockie around. This is from the handspun local alpaca I got. It's loftier and denser than I'd have imagined. Definitely use a #2 needle next time. Possibly a #3. 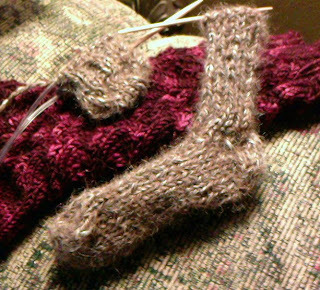 That's the toe for the second one on the #1 circulars next to it. And they are both lounging on top of my one Baudelaire sock. Keeping it company. I will now have to re-wind 1/3 of my alpaca ball because one of the kitties (I don't know which..) took it out of the bag, and unwound it while I slept. So....apparently it's nice to snuggle with. 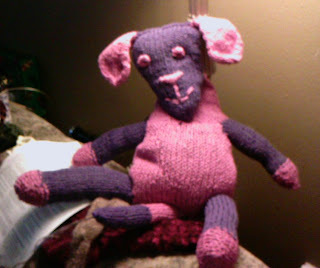 But now I have to attempt to detangle it so I can knit with it. Damn kitties. 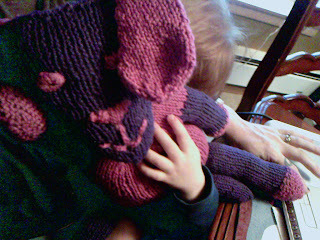 Here's Gabe snuggling up with Morgana's xmas present that I knit. I have to make him the stuffed kitty now because he is sorely upset that he has to stop playing with it so I can hide it and wrap it. Luckily she slept in today so I got around to the face. I really don't like embroidery on toys. I'm trying to get over that issue. And I'm convinced that pattern-makers must be lying when they tell you to make a 'french knot' for the eyes and you see their perfectly not small and circular "knots" on the faces. I thought I just sucked, but I decided to do a french knot, then do chain stitches from the center to the outside all around to make a dense circle. That seems to be the trick. All my knits love to hang out with my sock. 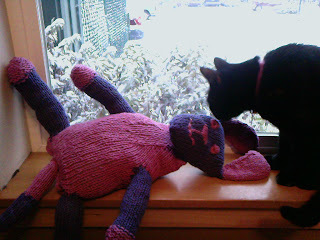 September takes a break from watching the snow to investigate the floppy puppy. Nope. Doesn't smell like alpaca. Back to the snow.